Adam Kimber sent me an email yesterday saying that he was inspired by Where's Tim and created his own real time GPS tracking website called Where's Adam. Very cool!! I can't wait to see what else he adds to it. Where's Jeff and John and Joseph and Tim? 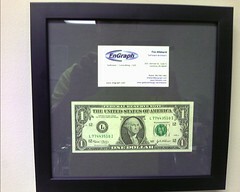 EnGraph was nice enough to get me a framed dollar bill for my first sale of Where's Tim!! Thanks guys! GPSReview reports on lost hikers in North Carolina that were found using the GPS chip in their cell phone after calling 911. The officers were able to put the hiker's location into their handheld GPS unit and find the hikers quickly. DG left a comment on this post asking how to use Response.Redirect with a KML file. The other day, I blogged about talking with Terry Rombeck from the Lawrence Journal World. He wrote a good article about using tracking teens and if GPS is an appropriate tool for that. The article is in today's paper and online here.